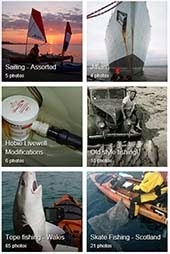 Well the cod are starting to make a show locally, not in any real numbers and not in my yak!. I've taken to the water twice in the last week putting out some big squid baits in the hope of hooking into a decent cod, but alas nothing to report on that front. 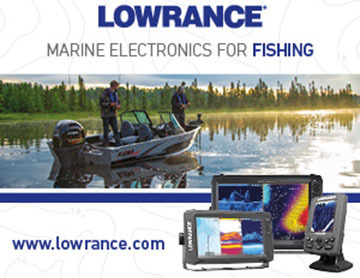 It was another evening launch which saw me fishing til almost midnight. Plenty of action was provided by dogfish, pouting and whiting. The pouting were a good size though the whiting were few in number and small compared to what I'd caught the previous week, no keepers. It was a deep water mark with the big springs producing a strong tidal flow. Heavy weights were needed to hold bottom which results in the smaller fish providing little sport. The temperature is dropping now, time for an extra layer under the drysuit. Well it's mid-October so I'd decided to try for an early cod, they're anything but plentiful down here resulting in me catching only one in the last two years!. A plan was hatched and the venue was Browndown, a local beach in Hampshire. The chosen area was a mile paddle from Lee-on-Solent, paddling with the tide took myself and Jim there in no time at all. The weather was simply excellent, the winds were low and forecast to drop further. 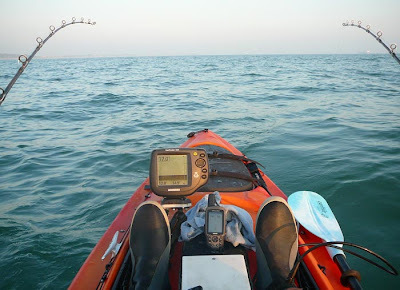 The drop off into the main channel was chosen as the first mark, anchors were dropped and a waypoint put into the GPS. I put a waypoint into the GPS every time I anchor as it's a convenient way to monitor anchor drag - this would prove to be a bit of lifesaver later. The tide was in early flood and the depth around 17m. The tide flow was quite fierce, normally I can fish most places around the Solent with 3-5oz with braid line, though I found myself needing 12oz to firmly hold bottom. Having the bait anchored hard to the bottom paid dividends straight away with a multitude of bites, totally non-stop. The mackerel strip was getting hammered with some hard rattling bites producing some cracking whiting. It was really pleasing, I've not caught whiting of this calibre since I was a kid!, within 30 minutes I'd kept three for the table, all 1.5lb or more. The pout were unusually large too, 2 fine specimens were also dispatched ready for Sunday lunch. On the downside the dogfish were all to plentiful, I knew when Jim hooked into yet another as I heard "f*ck off back to Anglesey!". A couple of other yak fisherman appeared in the distance, though they chose to fish much closer to the shoreline. The sun duly went down and we settled into the evening session. As the tide flow eased the whiting disappeared and the dogfish became the mainstay of the catch. I'd had enough of the doggie plague so I raised anchor and moved inshore. There were a few small boats out fishing the area too, I chatted with one, they too were on a cod hunt though were hitting the doggies and whiting as well. I'd paddled close to the other yakkers so I went over for a chat. One I'd met before, and they were having similar luck to us. As the temperature dropped off the odd patch of mist came and went, nothing exciting, generally the evening sky was clear. I eventually paddled back to where Jim was still anchored, on the way over the mist again started to come in, thicker this time. I dropped anchor twenty metres from Jim and resumed fishing. The mist was now turning to heavy fog though Jim was easily visible. About 20 minutes later I'd noticed my lead was bouncing, initially I put this down the the increasing ebb tide, though powering up my headlamp revealed the lines dragging..... I'd slipped anchor and not noticed (the weak link had given). Glancing uptide I could see a pinprick of light from Jims yak, 5 seconds later he'd disappeared into the fog. 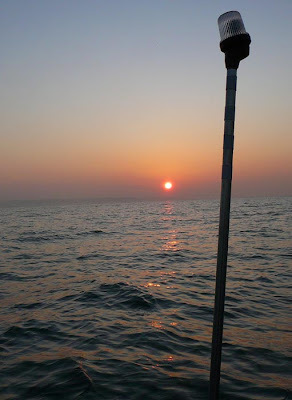 By the time I'd retrieved my fishing gear, raised and stowed anchor, etc, I'd drifted a few hundred metres downtide. The visibility had dropped severely, probably to 4-5m!. I'd not seen fog like this for 20 years or more, it was horrendous. Being on a yak at sea in thick fog is not terribly amusing. You have absolutely no sense of direction, what sounds you do hear are muffled with no real direction. I always carry a compass so paddling north would eventually see me hitting land, though the tide would cause quite some course drift - however, I had the GPS. Jim was anchored up somewhere in the fog, luckily I'd dropped my 'anchoring' waypoint at the start of the evening session so I duly paddled off into the fog, no point in looking ahead, both eyes were fixed on the GPS. I was nearly 500m away and steadily paddled against the tide. One thing I found very interesting, when you paddle in daylight you are naturally making course corrections, either a hard stroke, or a longer stoke,.. maybe 2 to one side to bring you back on track. In the fog you are not doing this due to the total lack of visual references. The result of this is a strong tendency to slowly paddle in a circle, this was all too clear when monitoring my progress on the GPS. I didn't see a hint of Jim's stern light until I reached the anchor waypoint and looked around, there was a faint glow uptide, it was Jim, exactly where I'd left him. He duly stowed his gear and raised anchor... how were we going to get back. Not a problem, the GPS has Bluecharts fitted so it was a simple case of locating the slipway launch point and selecting' GOTO'. It was a case of follow my leader and a steady paddle. Again, it was clear how you quickly you paddle off course in the fog. We came to within 25m of the shore and the odd dim fishing light glowed out of the fog. The GPS took us straight to the slipway, absolutely fantastic. There was a van on the slipway with his main beams on, trying to guide the fishing boats back in, unless you were with 30-40m of the slipway you'd not see them, not a chance. Chatting to a couple of the small boat owners around the slipway the odd interesting story emerged. One boat owner didn't even possess a compass and got lost a result. He'd even run aground on the beach twice in an effort to get home. I bumped into the other yakkers in the car park. One of them had a compass so they'd paddled north and eventually hit the beach, allowing them to make their way back to their launch point. What an experience, how quickly the weather can change. We were only a mile offshore yet were caught out within minutes. Fortunately I was suitably equipped, I did rely on the GPS to get me home, though if it had crapped out what would the outcome have been?. Well, as it happens I carry a spare handheld GPS and a compass so it was never a concern. But the fog wasn't the worst of it..... I'd placed my fish on a nylon stringer and somehow it had slipped loose during the evening, absolutely GUTTED. Oh, and one small boat had landed two cod in the 6lb range, very encouraging. 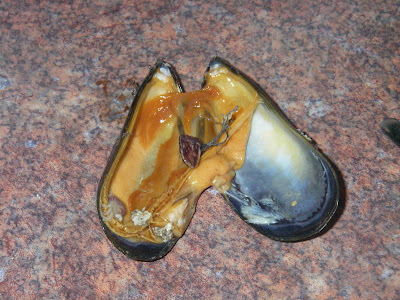 The common Mussel is often overlooked as a bait but its readily available on our foreshores and with a little preparation is a deadly bait either on its own or in a cocktail. 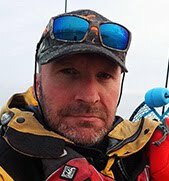 Its even better for us kayak fishermen as it stays on the hook better with little or no casting.In my younger days a bit of grannys hair net kept it on long enough to tempt good cod and a host of flatties. I confess I haven't used it regularly for ages but last weekend a trip to the seaside resulted in a plentiful supply for winter. 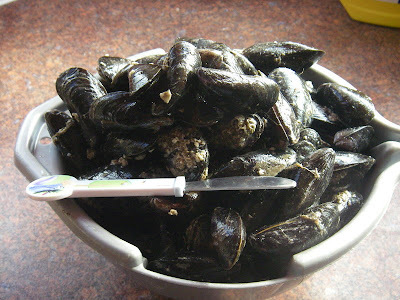 Opening the mussel is best with a blunt , thin tipped knife , starting at the end where the shell normally attaches to the rock. 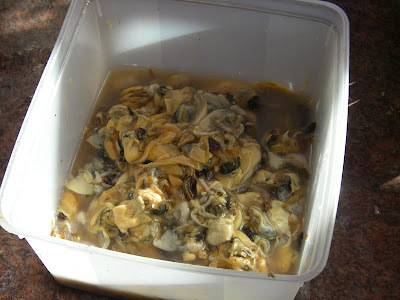 Once you gain access work the blade all around before carefully scrapping out all that pungent flesh You can open the shells with hot water but I always like to try first without..
An hour later and we're left with plenty of flesh! There are two ways I use the bait. 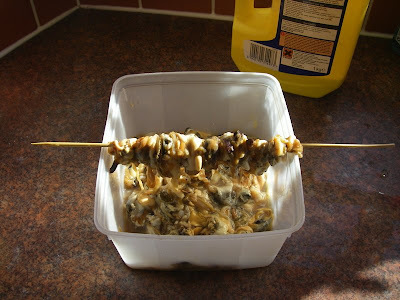 Firstly thread a good density of mussel onto a kebab stick , bind tightly with plenty of bait elastic and then slide off to leave a bound sausage of meat. Wrap in clingfilm and freeze. Out on the water you can then cut off a section , mount on your hook and bind on with a little more elastic - a perfect flattie bait. 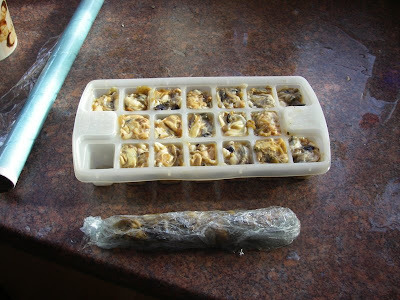 Secondly , using an ice tray , pack tightly. A tray and two kebabs ( one packet) ready for the freezer. 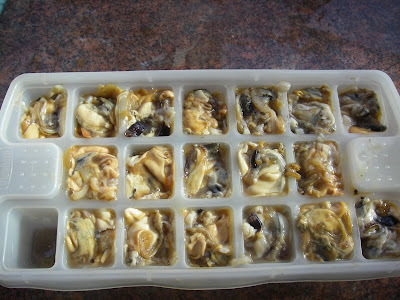 The mussel cubes are ideal for filling squid for those monster cod. Many thanks to Egbertnobacon for this article. When I purchased my Big Game it came with a seat as standard. It's actually not a bad seat, though I found that after 5-6 hours fishing I'd been shuffling around a bit due to 'numb bum syndrome'. Christmas was just around the corner and that was the only excuse I needed to purchase something more upmarket. I decided on the Crazy Creek III chair as it had received some good reviews, both here in the UK and over the pond in the US. 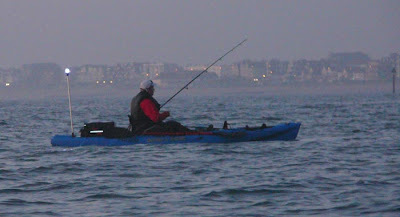 The chair was purchased from H2O kayaks for around £35 and duly arrived within 48 hours, good service. The quality is good, well put together using 600D nylon for the covering material. The base must be 4-5cm thick making is very comfy, though bear in mind this will raise your centre of gravity on the yak. 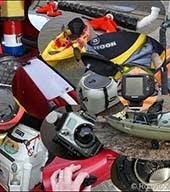 Not a problem for me on a Big Game but it would be noticeable on other less stable kayaks. The swivels clips are brass items, though plastic ones are also included. Fitting was a bit of a fiddle taking a wee while to get it positioned and adjusted correctly. 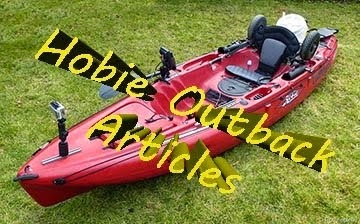 With the seatback vertical paddling is a comfortable experience, it's easily adjustable on the water if required. It's possible to recline the seat basically by sliding your bum forward so relaxing is achieved with ease. It's so comfy that I've nodded off to sleep on more than one occasion, one time for over two hours!. 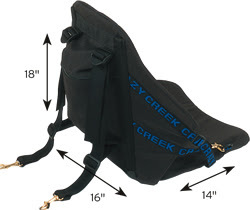 On the rear of the seatback is a zip pouch in which can be housed a 2 litre hydration pack. I purchased one for for around £5, though it's yet to be used effectively due to the non-existent summer this year. 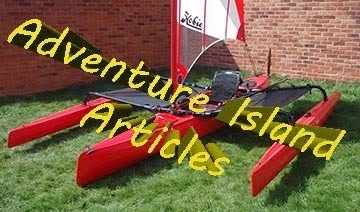 The chair can be removed from the kayak, and with the backrest clipped to the base it can be used as a seat, on a campsite for example. I've now had the chair fitted for a year and it's proving very comfortable and durable. The only sign of wear is some light corrosion on the forward brass hinge clips, shown below. The seat is thoroughly freshwater washed and dried post each trip. Despite this light corrosion the chair should easily last several seasons before they require replacing. It's turned out to be a good purchase which I thoroughly recommend.